A recently launched enterprise in Uttar Pradesh, manufacturing appliances that use artificial intelligence to generate green electricity, is availing tax exemptions from the government. A company in Maharashtra, manufacturing ayurvedic products to increase agricultural productivity and prevent crop infec­tion, is benefiting from provisions such as fast-tracking pat­ents at lower costs. The Biotechnology Industry Research Assistance Council (BIRAC) recently awarded a government grant to a company in Tamil Nadu that is improving industrial processes using biotechnology. A new strain of enterprises is mushrooming in India, and the government seems to be gearing up to recognise and support most of them through an upgraded ‘Startup India’ action plan. The policy, launched by the Centre in January 2016, has managed to recognise more than 830 such companies that are working towards innovation, development, deployment or commercialisation of new products, processes or services. Most of these companies are into sectors such as healthcare, renewable energy, IT and agriculture. While more of such companies are being identified and supported by the government on a daily basis, the major emphasis of the policy is on creating many these forward-looking enterprises in times to come. Developing these high impact, high calibre entrepreneurs necessitates inculcating an aptitude for entrepreneurship and innovation in their formative years. The government has started sowing the seeds by establishing more than 457 tinkering labs in schools throughout the country, giving each of them a grant of Rs 12 lakh. For the more matured lot, 16 world class incubators are alre­ady in the process of being esta­blished or upgraded (with a government investment of about Rs 160 crore), and many more are in the pipeline. Freely available short-term courses on entrepreneurship, which have facilitated training of more than 1,50,000 aspirants till date, are providing further impetus to the idea. If establishing hard and soft infrastructure is one approach taken to promote entrepreneurship, improving parameters related to ‘ease of doing business’ is the other critical facet in pushing the envelope. An urgency to make the filing of intellectual property rights applications simpler, faster and more reasonable, has impelled the Centre to create panels of around 500 facilitators for both patents and trademarks. A new legislation enabling startups to wind up operation within 90 days (if they fail), and provisions for self-certification under seven labour laws and three environmental laws, seem to be encouraging prospective entrepreneurs. Promoting innovation and simplifying laws are effective ways of seeding the idea of starting up. Eventual creation of new enterprises entails enabling entrepreneurs to easily acquire resources for take-off. In the Indian context where 84% of the total enterprises are established through self-financing, creating alternative sources of funding is crucial. Two initiatives stand out with respect to funding: a plan to create a fund of funds of Rs 10,000 crore over four years and a proposal to establish a credit guarantee fund of Rs 500 crore. The former has augmented the capacity of the Venture Capitalists (VCs) and Alternate Inv­estment Funds (AIFs) not to rely on foreign investments and equitably fund enterprises in manufacturing, agriculture, health, and education sector —more than Rs 600 crore are already invested in 62 such startups. The latter has made an enormous amount of debt funding available with institutions (such as banks) who are lending more freely to startups than ever. Striving to create a differential impact in its second year, the policy has a mammoth opportunity to further optimise some of its proposals. For instance, the only enterprises eligible for direct tax breaks are the ones that are registered after March 2016. This has restricted the number of such beneficiaries to a minuscule 10, and amending it to bring all startups under its purview has the potential to catalyse the space considerably. Immediate steps need to be taken to recognise and support many more startups considering nearly 70,000 companies are registered in India annually. A more lenient definition of startups can do the trick. 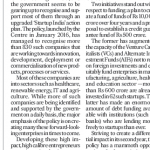 While we are still witnessing how things unfurl, it cannot be denied that the Startup India has effectively managed to bring startups at the centre of the economic discourse. The very fact that nearly 20 state governments have managed to launch their own version of the startup plan exemplifies a cultural and policy shift in the entrepreneurial landscape.